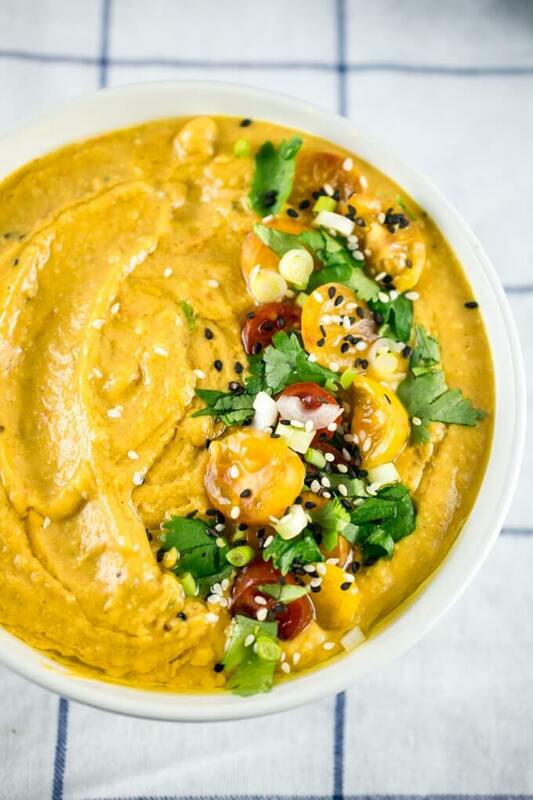 Curried lentil dip made by infusing Indian spices into ginger, garlic, chili peppers and tomatoes, and blending together with tender red lentils and coconut oil. 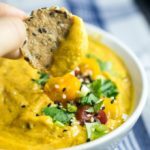 The result is a hummus-style dip that tastes like a samosa and can be served warm or cold! You all know that I’m crazy about samosas. That shatter-crisp fried pastry shell and spiced potato filling make me weak in the knees. I’m on a continual pursuit to recreate samosa flavors in healthier forms like samosa soup or samosa wraps. 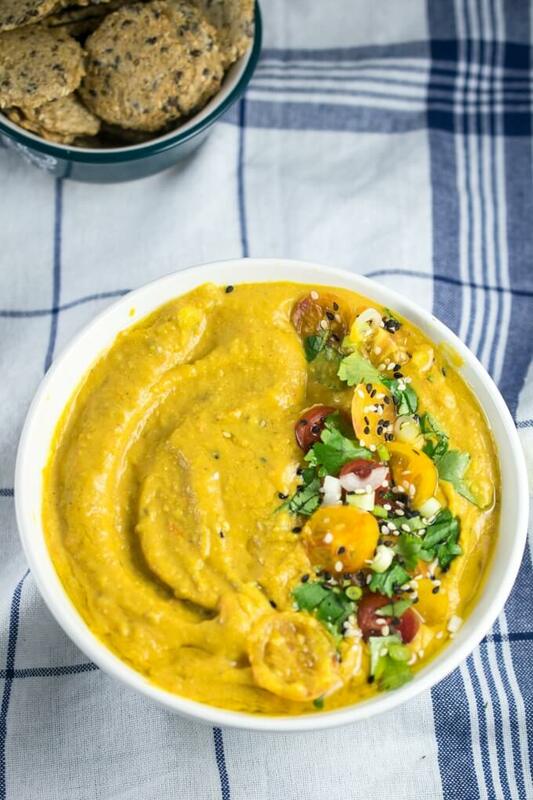 This curried lentil dip is the latest iteration. I took that delicious seasoning from samosas and blended it with coconut oil and red lentils to make a spicy vegan lentil dip. You have some flexibility for what add-ins to stir into the dip. Fresh cilantro and/or green onions are both wonderful additions. Chopped almonds, dried fruit like currants or raisins, or a drizzle of chili oil would be nice with this too. Enjoy! 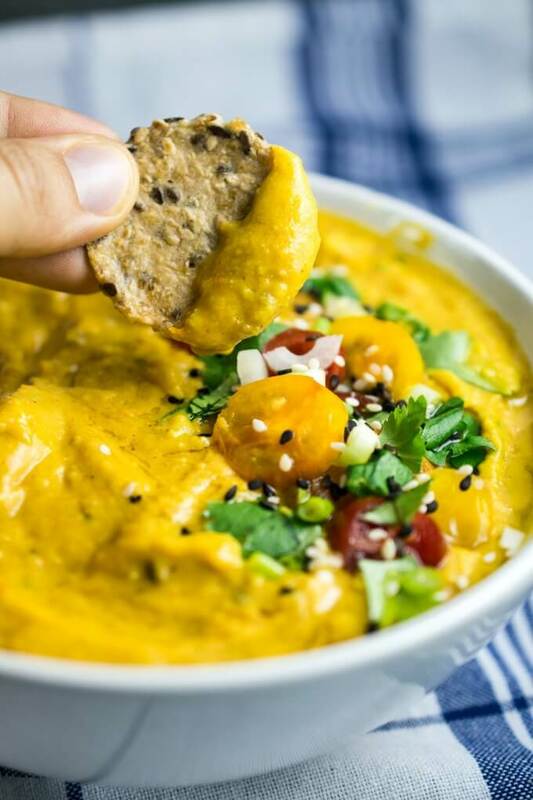 Easy, spicy curried lentil dip made with red lentils and Indian samosa-inspired spices. Naturally gluten-free and vegan recipe. Cook the red lentils if you are starting from dry lentils and haven't cooked them yet. Heat the coconut oil in a large skillet (preferably nonstick). Add the coriander seeds and cook just until starting to turn golden, about 45 seconds. Add the ginger, garlic and jalapeno, and cook for another 60 seconds until slightly softened. Add the ground cumin, cayenne, garam masala, and turmeric, and cook for 30 seconds more until fragrant. Stir in the salt and diced tomatoes, and reduce the heat to medium-low. Continue to cook, stirring occasionally, until the tomatoes are starting to break down and release their juices, about 10 minutes. (I use this time to prep the cilantro and scallions, and clean up from cooking the lentils). Add the lentils to a food processor. Use a spatula to add the spice and tomato mixture, including all of the oil in the pan. Blend until smooth. Add the lemon juice and blend. Season to taste with additional salt and lemon. Remove the mixture from the food processor. Stir in the fresh cilantro and scallions. Serve warm or chilled! Leftovers will keep in the fridge for about a week. To substitute ground coriander for the whole seeds, use 1 teaspoon ground and add it with the other ground spices. To make the dip more spicy, add ground cayenne to taste along with the other ground spices. Adapted from my samosa wraps and Vegan Richa. Tastes amazing! Used some more oil in the blender to make it even smoother and used sambal oelek instead of jalapenos, but yum, what a great recipe! This is deliciously fragrant! I have NO idea why this isn’t getting more hits/shares! Mine is in the fridge right now waiting to be slathered all over a lavosh bread, rolled and gulped down for lunch tomorrow! Sounds like an amazing lunch! I appreciate you taking the time to comment. Sometimes I’m pretty surprised by which recipes are and are not popular. But like you, I think this one is worthy of some attention!